Customs officers inspect the content of a container. MIRI: The enforcement division of Malaysian Customs Department here had seized a container suspected of containing cigarettes with no customs clearance on Tuesday at the Miri port after an inspection was carried out there. Sarawak Customs director Dato Sharifah Halimah Tuanku Taha in a statement yesterday said upon inspection, the enforcement team found 25,000 cartons of various brands of white cigarettes in the container with the equivalent number of 5,000,000 cigarettes with unpaid duties and taxes amounting to RM3,664,672. “To mislead the authorities, the items were declared in the import manifest as tissue houseware. A number of tissue boxes were placed in front of the container but after being thoroughly inspected, the enforcement officers found the hidden cigarettes and thus thwarted the smuggling attempt,” she added. She said the case is being investigated under Section 135 of the Customs Act 1967 where upon conviction, the offender shall be fined not less than 10 times the amount of customs duty or RM100,000 in accordance with any amount greater and not more than 20 times the amount of customs duty or RM500,000 in accordance with any amount greater than or imprisonment for not more than 5 years or both. The Customs Department said it welcomed information from anyone on any party including traders who store or sell illegal cigarettes and liquors. They can contact the Customs toll free line 1-800-88-8855 or Customs headquarters in Sarawak 082 -472133 or any nearby Customs office. 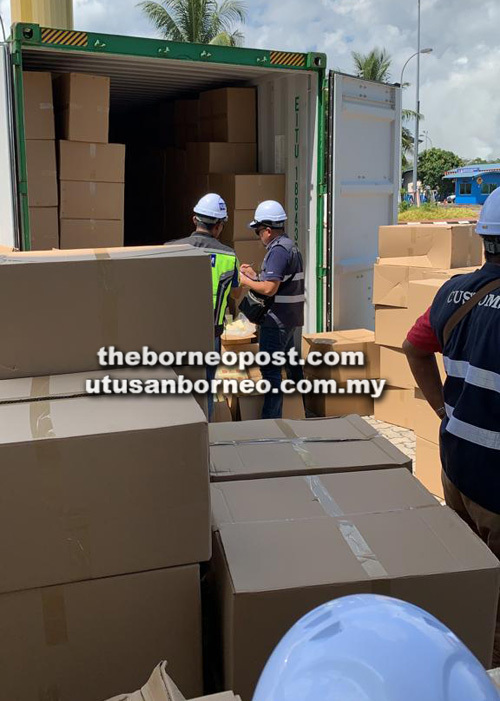 The post Customs Department seizes contraband cigarettes after inspection at Miri port appeared first on Borneo Post Online.